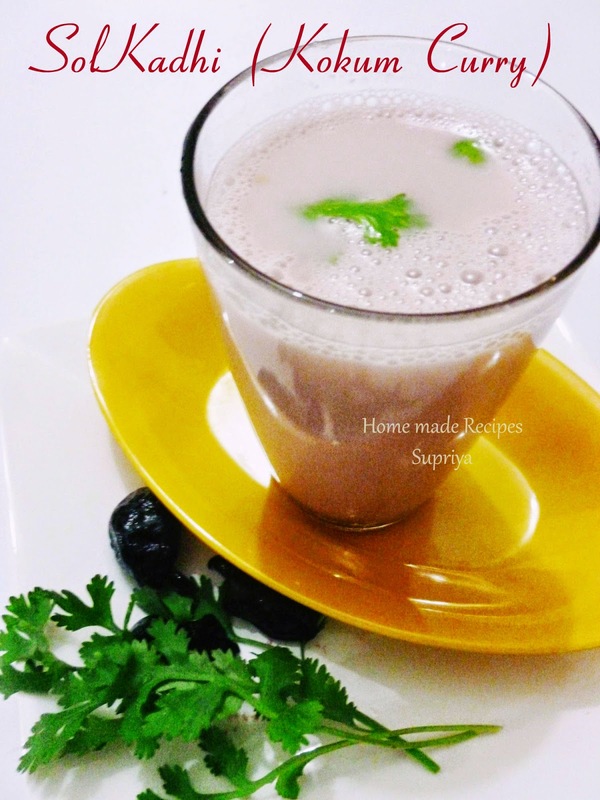 Kokum Curry also known as Sol Kadhi is a very popular drink in Konkan region especially in Goa and Maharastra. My granny prepares this almost everyday in Goa. It can be prepared with or without coconut. It's usually served with hot steamed rice or you can have it as a drink with your food. I like to have it both way. This Kadhi is also very good for digestion purpose. 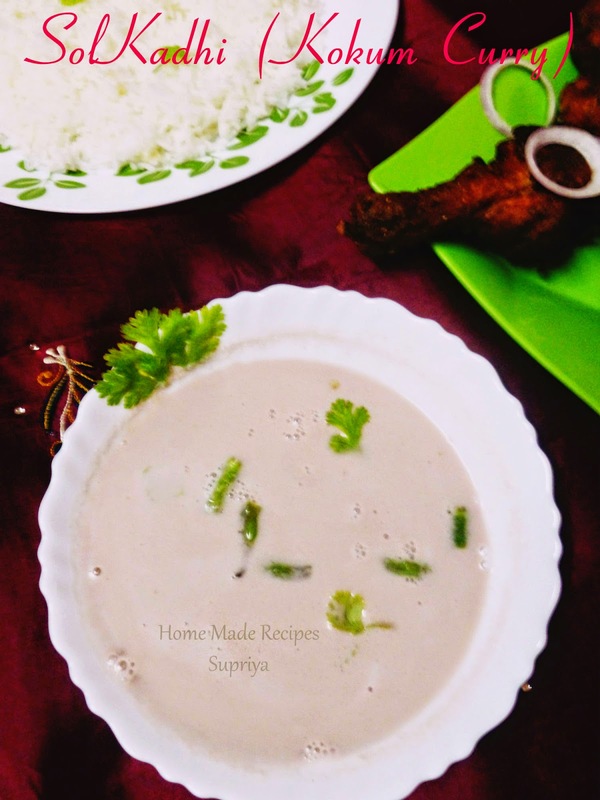 Preparing this kadhi is very simple and it doesnot need to be cooked on a stove. Just soak some kokums, extract coconut milk, do the tempering and its done in minutes. I prepared this recently and enjoyed our simple meal with rice, Grilled Chicken and SolKadhi. 1. Soak kokum in 1 cup of water for 30-45 mins. You will get a nice deep red water color when soaked. 2. Add crushed garlic and chopped green chillies to the kokum water and keep aside. 3. Extract coconut milk from coconut. To extract coconut milk, simply grind the freshly grated coconut in the blender with little water and then strain to get a thick coconut milk. 4. 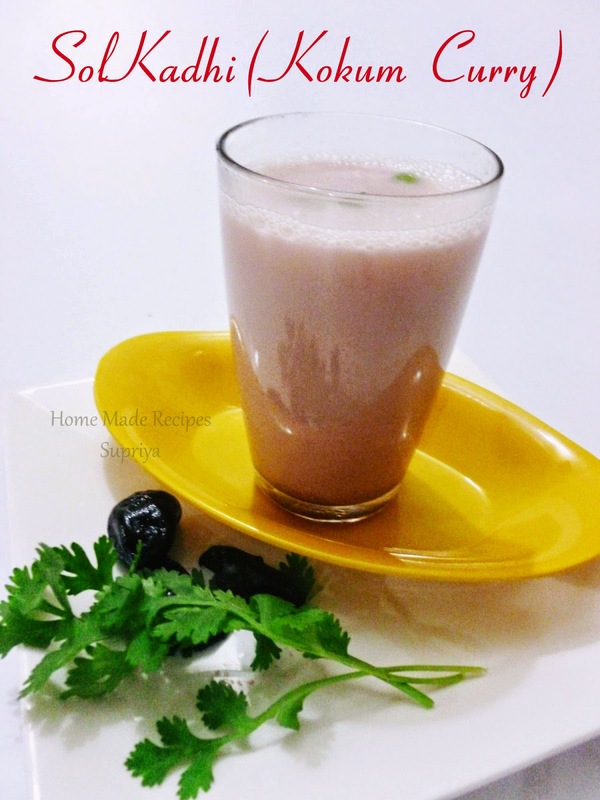 Add this coconut milk to the kokum water to get a creamy pink color delicious solkadi. 5. Add salt to taste and chopped coriander leaves. Mix well. Delicious Kokum drink is ready to be served.